Our goal is to assist flying enthusiasts with their airplane baby bedding and designing an aviation themed bedroom that is safe and attractive for an affordable price. Whether you fly planes for fun or as a profession, you will probably want to share the wonders of flight with your kids. We want to help you find the best crib bedding set for your lil’ pilot as well as airplane bedding for older kids with all the decorative accessories to match. Everybody has their favorite period in the history of aviation. You will want your aviation bedroom theme to feature this preferred style of airplanes in your decor from the wall decorations to the rugs on the floor. When you landed here, your job became much easier. 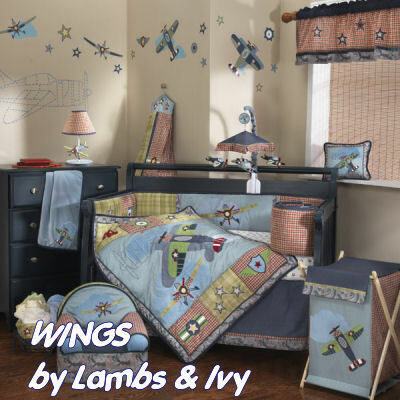 Airplane baby bedding comes in fabrics perfect for airplane baby nursery themes featuring all kinds of planes from vintage WWII airplanes to modern jets. I have a soft spot for the vintage style of airplane so homemade quilts and baby comforters with airplane applique hemmed in a homespun buttonhole stitch are just perfect for my taste! I love the history and romance of those dog-eared leather flight helmets and the scarves streaming in the wind. I can imagine a sweetheart giving the pilot and a kiss goodbye as she drapes the silk scarf around his neck before a top-secret mission. If mom’s a pilot for one of the big modern corporations and Amelia Earhart was her hero, you might need some baby aviator decorating ideas for a baby girl’s room! That’s not a problem! Airplane baby bedding is gender neutral and with a few feminine accessories you’ll have a fabulous baby girl’s room as well as a airplane nursery theme. Frame some pictures of Amelia Earhart or put a lipstick smile on the nose of one of the planes just for fun. Some of the airplane baby bedding needs a little lightening up. The realism of war may be a little too dark or dramatic for childrens rooms. Vintage airplane bedding pictures lots of images of the planes that were used in WWII so brighten things up with a cute mobile over the infant's airplane themed crib or maybe some baby Snoopy the Red Baron stuff. You can put most any kind of spin you want on your airplane baby bedding that you want from the ultra-modern bedding design with flashing chrome jets to a vintage theme with patchwork quilts. There are so many airplane crib bedding sets that you are certain to find just the one for you and your baby aviator. Many times you can find a great set at a closeout bedding sale for a super discount with free shipping if you’re lucky. Combine the style that you prefer with some airplane wall stickers or decals and there you will have the best airplane baby room decor on the planet. 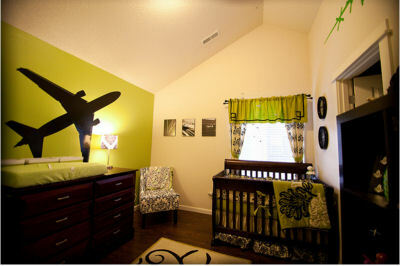 Unique Baby Gear Ideas features photos of many nursery decorating projects that will help you design the perfect aviation nursery for your baby in our gallery so please take a look before you go!